Service manual that I have doesn't cover the lv series. Lav is there though. For it I see 37.5 ft lbs for aluminum. I assume that should work for the lv. This mower was left at our charity dumpster. I'm wondering how much shift would cause a no start. This one had a tiny shift, not sheared. It has spark. Tried another plug too and just over 60 psi but doesn't fire on carb cleaner. Well, it will run OK with a crease in the key. Sheared 1/2 way could throw a fit or not. Is it a nice mower over all yet? It's in decent shape , just won't fire. No handle and cables but my plan was to attach to this set up to replace one using oil. When I drive past properties with crazy big lots, I think to myself, "Yikes, how big of lawn mower does that guy need?" I must say I like your solution. I have two suggestions. I'd hate to see you go over a bump and lose your vice grips. May I recommend a section of rope looped around a few times and tied off? Next, with that much property a man can get thirsty. Rather than interrupt your mowing I like the idea of a multi-axis swinging soda can holder mounted to the tractor. I sort of need handles for leverage to start. The right unit is an old moto mower with no lever. It has a throttle/stop lever and a couple times it has brushed a tree and shut down. I did a bunch of restart pulls the first time until I realized what was wrong. I'm stumped. I have new flywheel key in and torqued to spec. Still no fire. Testing further I had spark only with plug not installed. So I found another coil. Now I have inline spark with plug installed but still no fire. I pulled valve cover. Clearance is .005 on intake and .004 on exhaust so no valve is open. I rechecked compression and got 65 PSI. All firing test is on sprayed in carb cleaner. I guess I could pull head and look for cocked or burnt valve. I don't see that setting up carb with fuel would make a difference. I've always had dirty carb ones just fire on the carb cleaner when testing. 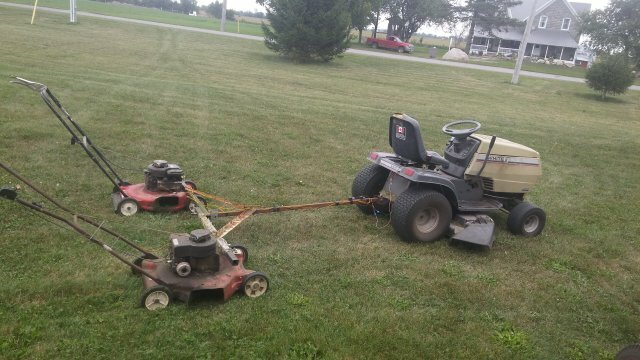 I'm not sure if there is a control on this mower or not. Have you tried with the kill wire disconnected and confirmed the coil is not flipped? Otherwise I'd guess that I would pull the head too and have a look. Maddening little bugger. I have it running. As I said there was spark with plug in it after replacing coil. When it still wouldn't fire I pulled plug to see if it was wet and noticed I may have failed to gap the new plug. It was less than .020. Gapped it and tried again. I had also done quick clean of the main jet and idle jet . So on carb cleaner it would sputter ever so slightly and stop. Just kept trying until it ran a bit. I pulled carb and ran it in the ultrasonic. Replaced nozzle o rings and needle/seat. Back together it would stay running. I put a good dose of MMO in the gas and it will start and run if I continue some primer pumps and after it warms up it will run on the mix. Manual says it takes .62L of oil. I had 600 ml in a jug. Poured out 60 and added 60 MMO but when I put it in the engine it seems to be full at 500. Not sure why. It drained out over supper time and unit was level. When I first started it I pushed it into grass and it died. It was adjusted for pretty low cut. I got front up a bit and it would stay running in grass. But maybe it had problems because I found the blade mounted upside down so the wing tips were heading into the grass.